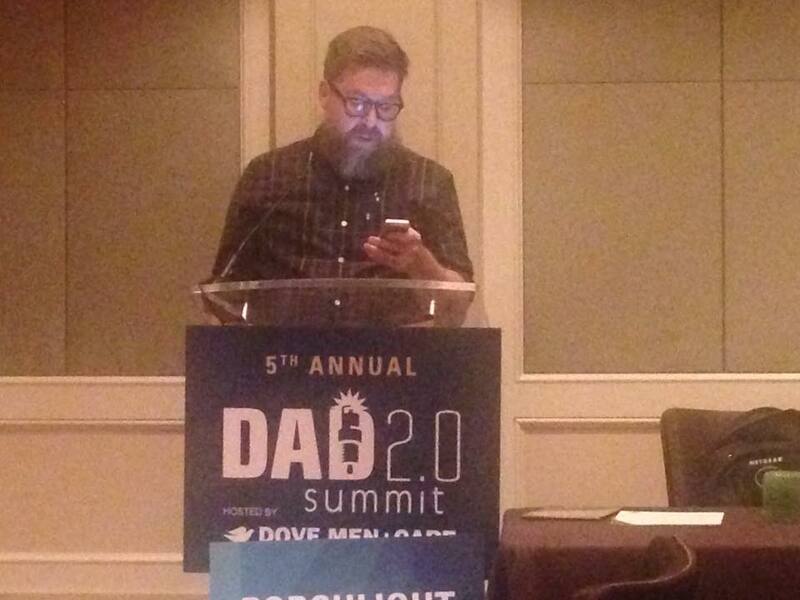 Three years ago, at the suggestion of a friend, I applied to speak at a dad blogging conference with 0 expectations of being selected. I was relatively new to blogging, and while I had worked in marketing and social media for a while, I figured there were plenty of people more suited to speak. A few months later I got a message on Facebook from Doug French, co-founder of the Dad 2.0 Summit asking if we could hop on a call and find a place for me in the speaking schedule. In my reply, and the subsequent phone call I kept my voice at an even keel and told myself over and over in my head to do my very best to sound like this was just a regular thing for me. It wasn’t. When I hung up with Doug I immediately called Stevie and let out the child-like excitement I had tried to keep hidden. 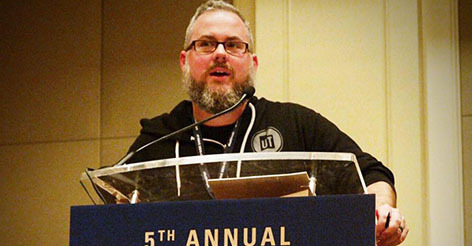 A few months later I picked up my “speaker” badge from the registration desk of the J Willard Marriot in New Orleans and felt a sense of pride in myself that had only been surpassed by the four moments. On Friday night I was able to add another one to the list. Sure, that's a bit hyperbolic, but it was a really great night! I'll explain. I'm not sure if you know this, but there is a pretty tight-knit community of Dad Bloggers out there. We congregate online to talk about all things parenthood, some things blogging, and pretty much everything else. We argue and squabble about religion and politics. We read and share each others' posts. We ask for and give advice that is sometimes wrong and sometimes right. It is a community unlike any I have ever been a part of, but despite how close we are, one thing we rarely get to do is hear each other. 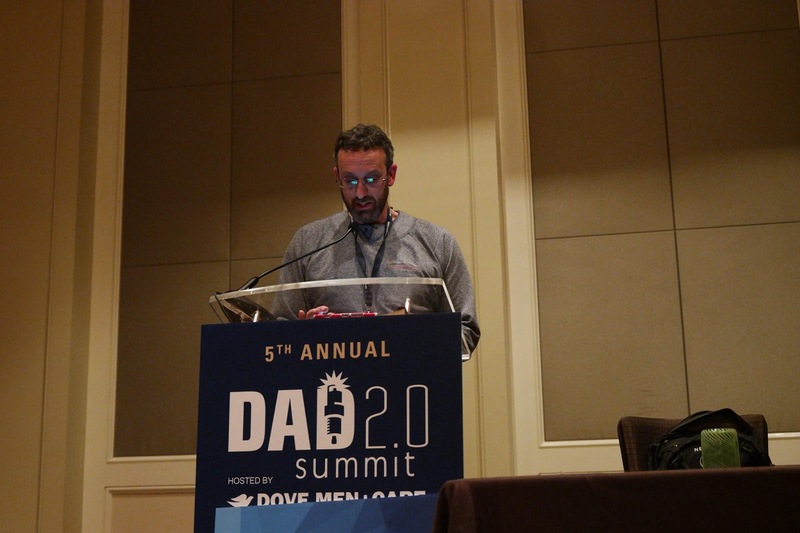 For the past 6 years Dad 2.0 Summit co-founders Doug French and John Pacini have worked to not only give dads a voice, but to also foster conversations about our roll of the modern father. In years past, conference goers have attended key-note speeches and panel discussions about helping out more in the home, finding work life balance, working with brands to promote the image of an engaged father in the media in contrast to the bumbling, goofy one that was once such a problem. In-between these sessions, the conference usually selects 4-6 spotlight readers. These are dad bloggers, like myself, who aren’t famous published authors, media personalities, or professional speakers who are selected to stand in front of a room of several hundred of their peers and read something they have written about being a dad. They are usually a mix of humor and more serious subjects. The first year I attended, I heard Lorne Jaffe of Raising Sienna read a post about clawing his way through his often crippling anxiety to find a way be the father his daughter needs. I was moved to tears. I needed more. Four readers a year wasn’t enough. I immediately knew what my pitch for the following year would be. We needed an open mic. The next year my pitch didn’t get picked up. I’m sure there were logistical reasons, but I was bummed. 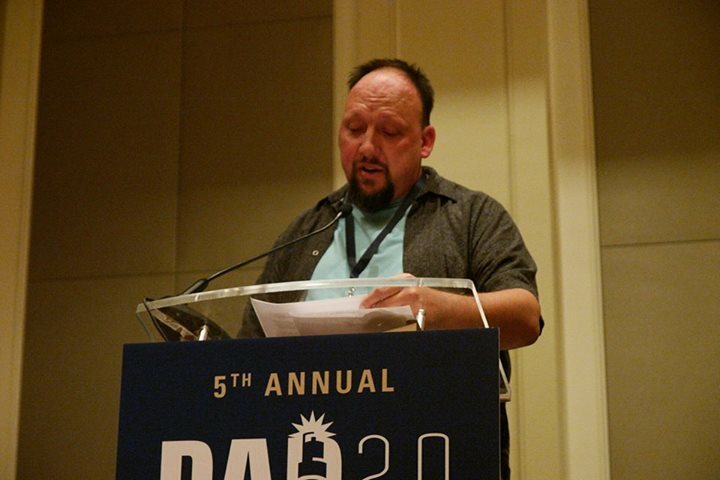 I was also honored to be picked to speak on another subject that bloggers wanted to hear about, SEO. But I knew, deep down, that what I really wanted was to get more of the guys to read their work. I remember mentioning the idea to one of my dad blogger friends. His reply was disheartening. “I don’t think it will work. I don’t think enough guys will want to give away a night of their conference to sit in a room and read their posts.” Part of his fear was also mine. The nights at this conference are usually saved for festivities and libations. Would a big enough group of guys want to just hang out and hear each others' words instead of a night out on the town in a fun city? I closed my eyes and saw the standing ovation Thom Hoffmon received after reading a post about his son in 2015. Yes. If we give them a podium, they will come. I set my sites on 2016. 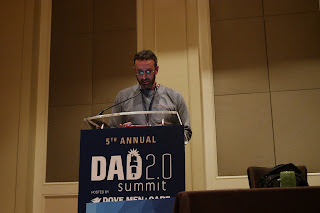 This year I was asked to return to Dad 2 Summit to moderate an awesome nuts and bolts blogging panel about making data based decisions to grow social channels and content creation. That may sound boring, but as an online marketing guy it is something I know a lot about and have a ton of fun speaking on. I was elated to be invited back for a third time, but before I let Doug off the phone I gathered up any courage I could find and brought up my passion project. I wanted them to have an open mic, in the vein of The Moth and Listen to Your Mother, for the guys. Not only did I want them to agree to have it, I wanted plan it, prep it, and host it. Doug didn’t take any convincing. He even had a name. DadSlam was born. Doug is good people. There was one problem. DadSlam was an official conference activity, but it wasn’t a sponsored one. The way the blogging conferences work is that most of the revenue comes from the brands that sponsor it in the hopes of making contact with a group of influencers. The brands will set up booths, sponsor room drops with fun product, and even sponsor activities by providing a location, food, and drinks. Doug and John were able to get us a location, but it was too late to secure a sponsor. To make things even more stressful, DadSlam was on the schedule for Friday night 9:30 until 11:00. From 6:30 – 9:00, the awesome folks at LEGO were taking pretty much the entire conference to an after hours party at the Smithsonian with amazing food and plenty of yummy beer. Outwardly I had always been confident that people would come. 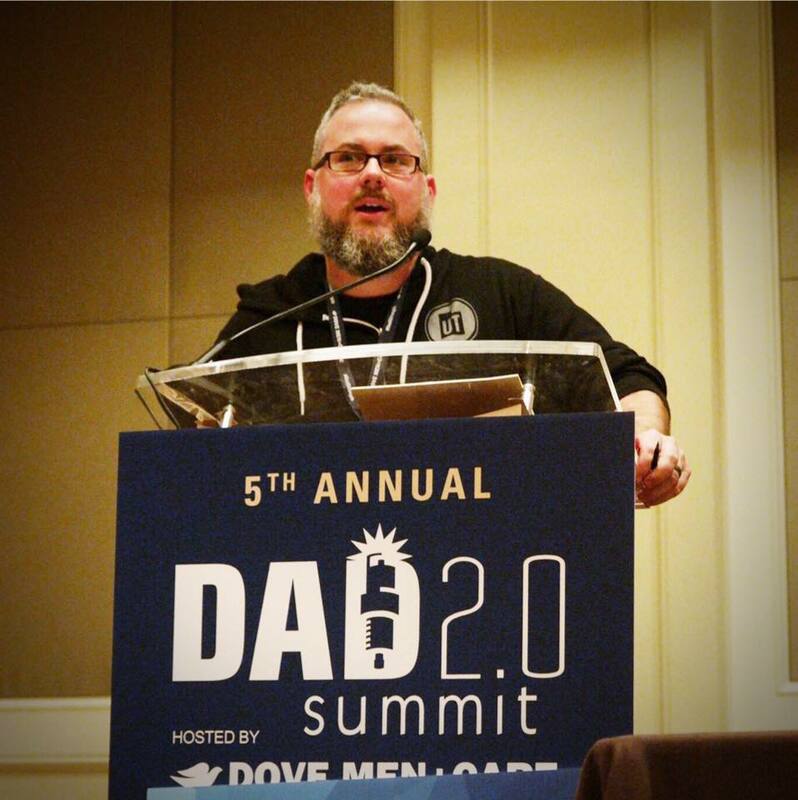 At around 8:30 when I called Uber to get from the Smithsonian to the hotel to set up the room for the first DadSlam, I looked back at the giant room of dads drinking and eating and laughing, and for the first time worried that none of them would follow. Well, as I already spoiled at the top of the post, that didn’t happen. With five minutes to go before our first DadSlam the room was at 80% capacity. At 9:35 we were at standing room only. I started the night out with a few laughs and a regrettable story about my kids and Mcdonald’s play place, and by the time we had 5 readers up there were so many names in the hat that it would be impossible to get through them all. My face hurt from smiling. Guys read funny posts and sad posts. One started crying mid-post and another dad came up to the podium and put his hand on his shoulder until he was able to compose himself and finish reading. We had standing ovations and hoots and hollers. It was a thousand times better than I could have ever imagined it would be. Here’s how good it was. When 11:00 PM came around and they kicked us out of the room to clean it, we picked up shop, moved rooms and kept going for another hour. Nobody wanted it to end. For the rest of the weekend guys continued to come up to me and say how much the #DadSlam meant to them, and how it was the highlight of the conference. I couldn’t do anything but agree. It was more than the highlight of the conference for me. It was one of the best nights of my life. If you liked this blog, please come find me on the Ask Your Dad Facebook Page!